Are you ready to design your dream kitchen? The kitchen is often referred to as the ‘heart of the home’. It is where the family interact, where meals are prepared and it’s where guests migrate when you’re entertaining at home. That’s why your kitchen must be both beautiful and functional. 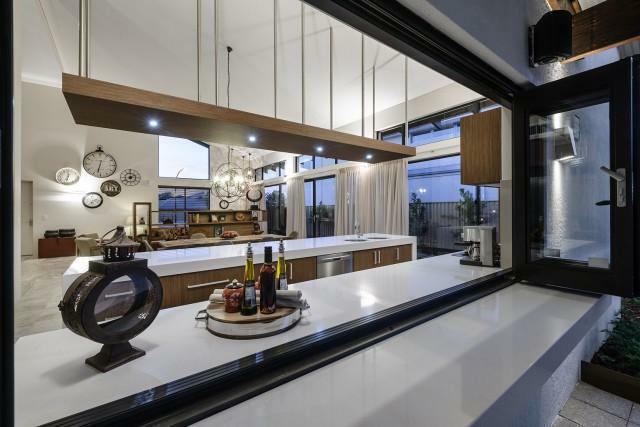 Here we share with you 6 tips to achieve both practical and elegant kitchen design. Ensure when you are design your new home floorplan that the kitchen is central to your home design and not cut off from the main living areas. This way your kitchen will be large enough to accommodate a meals table or considerable centre island for food preparation and extra storage. Design your kitchen to be practical and ergonomic. Not only do you want your kitchen to look amazing, you want it to be functional too. Make sure your layout works efficiently. Your fridge needs to be accessible; your dishwasher shouldn’t block any paths either. Don’t forget you need ample bench and storage space too. For new homes dream kitchens, custom-made cabinets are a must! They reflect your individuality, make kitchen tasks easier and have a top-of-the-line finish thanks to expert craftsmanship. It is tempting to look at kitchens you see in magazines and dream about white marble filled spaces. While they are stunning, your kitchen is likely going to be a long term investment so you will want to choose materials that are durable. In the case of your kitchen counter top, it is worth investing a little extra money to ensure you receive a durable quality product. It is often better to have light fall in front of you than behind you to prevent shadows. If overhead lighting is not sufficient consider using LED lights in your wall cabinets to brighten up the bench space. Before you start designing your new home design, visit one of our Rural Building Company display homes to discover the latest in home design and construction.